Stock # 11418, 3.5L V6 SOHC 24V, 9-Speed Automatic, 7 mi. Push button start, moonroof, DVD player, and leather. 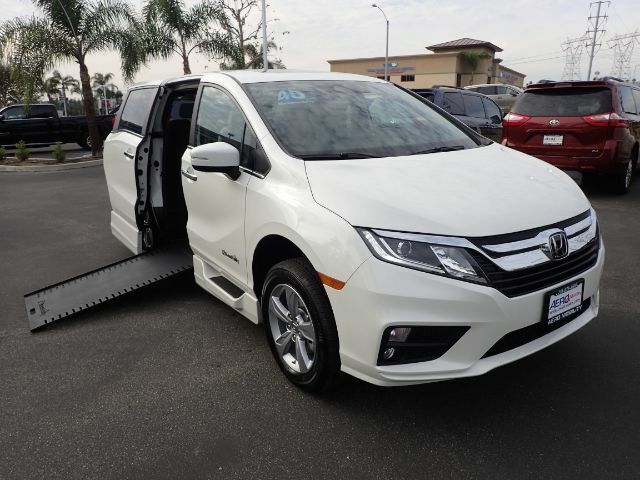 This 2019 Honda Odyssey EX-L is one decked out wheelchair accessible vehicle. Installed with an automatic in-floor 30.25" side-entry ramp by BraunAbility. Pearl white exterior with deep window tint is accented by the creamy interior. Both front seats easily remove for chair rider to sit in the first row. Safety features like blind spot detection, drive assist features and turn signaling side mirrors. Call 877.325.4000 to schedule a test drive or home demo.